Exclusive to Royal Caribbean, the secluded island of CocoCay (also known as Little Stirrup Cay) is located between the ports of Freeport and Nassau. One of the most popular activities is the parasailing adventure, where you get a view of the island’s spectacular scenery from 400 feet up. Other activities include a wave runner ride down the coast, a visit to Caylanas Aqua Park and an island-style seaside barbecue. Beautiful coral reefs surround the island and make for great snorkeling. 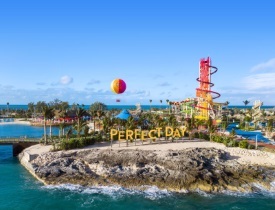 Beginning in May 2019, the island transforms into Perfect Day at CocoCay, a beach day experience packed with exciting new attractions for the whole family. Thrill Waterpark is home to a wave pool and Daredevil’s Peak, the tallest waterslide in North America at an astounding 135 feet! Relax at the Coco Beach Club’s infinity pool and enjoy upgraded cuisine, or take a ride on Up, Up and Away, a tethered helium balloon offering stunning Caribbean views from 400 feet above the island. Oasis Lagoon, the largest freshwater pool in the Caribbean, boasts a swim-up bar and various coves and islands to explore. Enjoy live music and a drink at Captain Jacks, or discover Splashaway Bay with its playful drench buckets and five waterslides. Perfect Day at CocoCay is an island adventure that will redefine beach days, ensuring adventurous thrills and relaxing havens alike.